RIBOCONE is a multi-purpose equipment that can be used for mixing, drying, cooling, vacuum drying, filtration & (vacuum) drying and heating treatment (for decreasing of viable cells, for crystallization, for chemical reactions). The products are lifted upwards along the heated side wall,and with the help of the vortex breakers, the products will get sunk downwards again inside the process chamber resulting in a uniform temperature and product humidity across the entire product chamber. 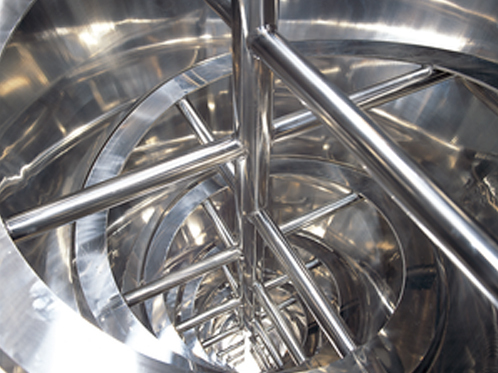 Its vertical design, and lack of bearing on the bottom of the vessel ensures a quick full product discharge. 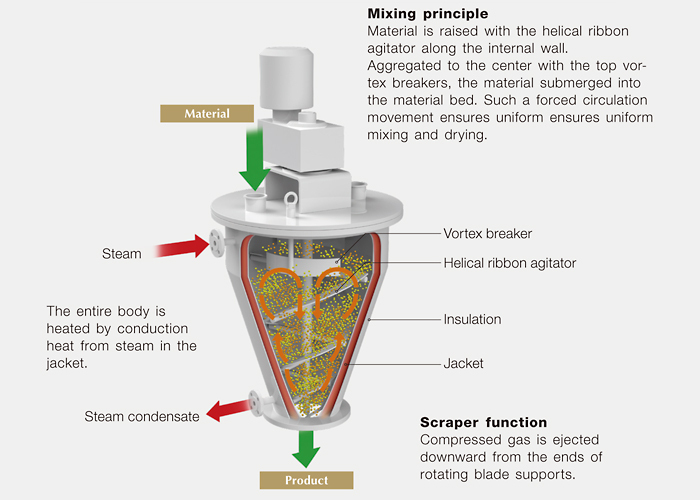 Drive and bearings are located outside of the mixing chamber in order to prevent risk of product contamination due to lubricants, amongst others.